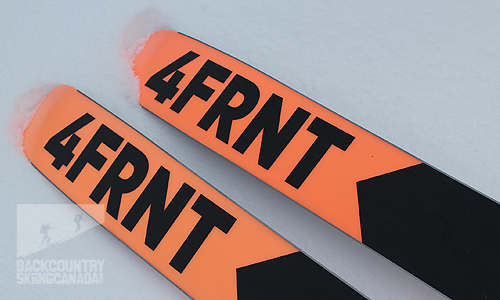 4FRNT’s new Raven skis were designed exclusively by Eric ‘Hoji’ Hjorleifson in their ‘White Room’ facility located at the company’s HQ in Salt Lake City, Utah. I had a private tour of this rapid prototyping research and development facility a few years back and was impressed at how nimble this made 4FRNT’s design process. they are able to experiment with new innovative ski designs and go from idea to concept to on-snow testing in only a few days. This was the genesis of the Raven skis and once the design was perfected, it along with the Renegade and Inthayne skis went on to be manufactured in the Utopie ski factory in Rimouski, Québec Canada. They ski even better than they look, the 4FRNT Ravens plus Marker Alpinist 12 Bindings. 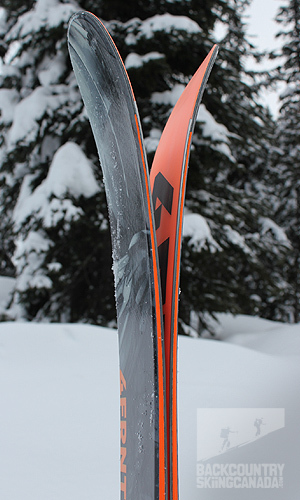 The Raven skis use a unique reverse camber design (similar to that of the Volkl V-Werks Katana and BMT 109’s) which enables the ski to get most of its bite from pressuring hard underfoot and taking advantage of the resulting enormous effective edge. As the ski arcs, the tips and tails engage providing a smooth and fluid carving motion from start to finish. In deep snow, the full reverse camber means the ski floats naturally and easily. Similarly, in variable snow conditions, this fully rockered shape is able to push through and over inconsistent snow conditions. The Ravens are simply able to handle whatever you throw at them, steeps, pow, groomers and crud. 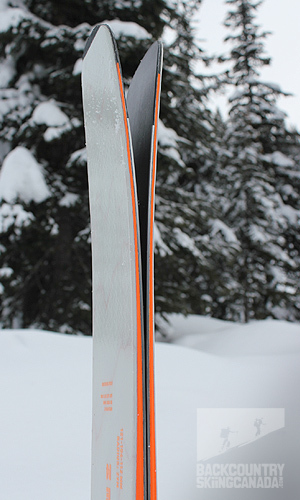 The core of the Raven skis is a combination of 100% clear Aspen and Maple woods. A minimal amount of maple is used where the binding mounts require retention and to keep weight to a minimum. The addition of carbon is used for its incredible strength properties while again keeping things light and unlike traditional fibreglass, carbon keeps the ski’s flex springy in nature. 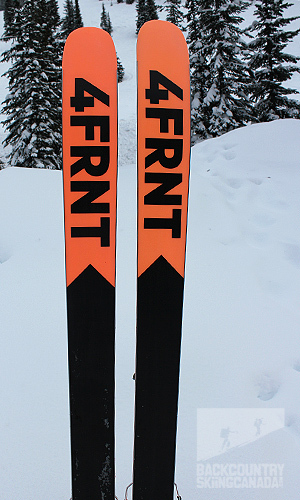 4FRNT runs the carbon fibre the full length of the skis in order to achieve these properties. 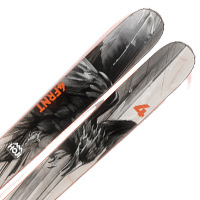 In the tips of the Raven’s 4FRNT uses a ‘Neotip’ design to calm and dampen the ski tips and increase their durability. This use of neoprene not only absorbs vibrations brought about by rough terrain and snow conditions but also enables it to resist shearing impacts that inevitably happen as the tips of the skis tend to take most of the abuse. 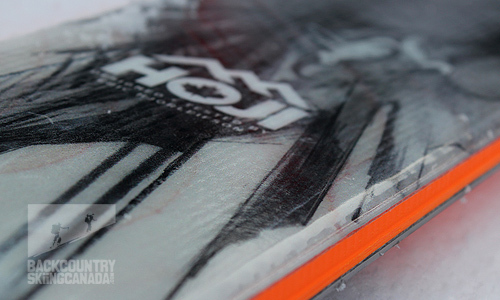 In the tails, 4FRNT has integrated a ‘Tail Block’ which eliminates the joint between laminates and edges of the skis. This seamlessly integrates the Semi-cap ABS sidewalls over the edge of the skis from the tips all the way to the tails. 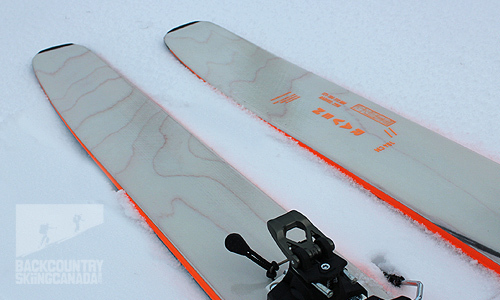 Things finish off with sintered bases under the skis for superior glide and durability. 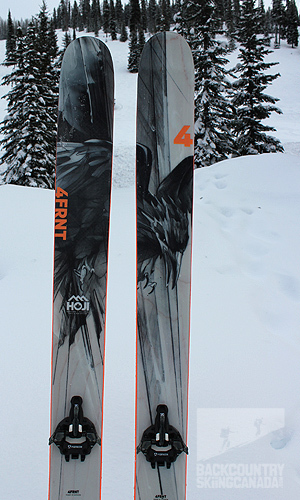 I mounted the 4FRNT Ravens with Marker’s new Alpinist 12 tech bindings to keep things light. While the weight of the Raven’s is more than respectable at 3,400g / 7.5lb it never hurts to put a full tech binding on them to ensure that the up is as much fun as the down. If you are after a pair of Raven’s you best be quick as 4FRNT has a limited supply. Since they now sell direct to consumer not only can you instantly check their inventory but you also get to save a few bucks in the process. 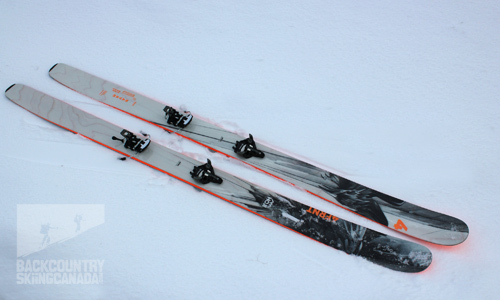 With this new model, all skis are capped at under $599US and you can add a pair of poles to your order for $19 - $79 for the Uptrack Adjustable Poles you see above… looks like cutting out the middle-man is good for everyone. Neotip - Neoprene to withstand shearing impacts, increases the durability and provide absorption and dampened that calms the ski. Carbon fibre- Running the full length of the ski to springboard the flex and add strength with minimal weight. Tail Block - Eliminates the sensitive joint between laminates and edge. 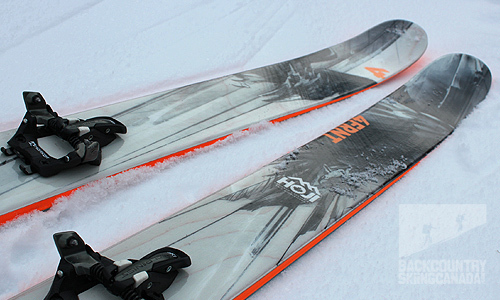 To say I was a little surprised by the performance of 4FRNT’s new Raven Skis is an understatement. While I was looking forward to their reverse camber design in bounds and light weight out of bounds I was sure that their 121/104/112mm dimensions were going to be just too svelte to qualify as a real pow ski. I’ve been used to skis with dimensions similar the Volkl’s V-Werk BMT 109’s which are 134/109/119mm so i was skeptical the Raven’s 121/104/112mm dimensions would perform as well. I don’t know how Hoji did it but the Ravens ski like they’re much fatter in pow. They’re not only stable but have just enough float to make you smile. The full reverse camber design ensures the tips are always on top of the snow even in chunder and crud. While a little more girth up front in the tips is always welcome, the Ravens never disappointed and any additional tip width would have diminished their performance on hard pack. 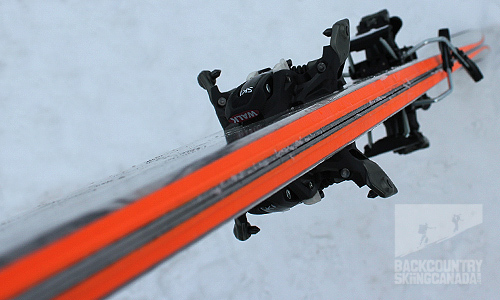 Like the Volkl V-Werks Katana Skis which also employ a reverse camber design, the Ravens absolutely rail on hardpack. With quite a bit less width overall, the Ravens are easy to put on edge and keep them there while still being surprisingly playful and full of pop. They love to go fast and if you open up the throttle be sure to hold on tight, while their stability doesn’t diminish one bit you can easily get going faster than you anticipated. They dampen out even the roughest terrain and should you back seat it, they are forgiving enough not to punish you for your lack of focus. The real magic with the Raven’s happens in their ability to tackle any terrain and snow condition, Hoji has designed a ski that’s fat enough to float in the backcountry pow yet narrow and nimble enough to be an absolute blast in bounds. While I’m used to skiing a much fatter ski in the tips and underfoot, the Raven has got things right. While bumps and trees were not exactly the Raven’s forte they sure ripped everything else up in sight. With the Raven’s reverse camber design they have a huge effective edge, I’d estimate it at over 80% of the skis length, all but the tip and tail rocker really. This allows the ski to carve masterfully on groomers and packed snow. The Neotip design eliminates most of the tip chatter and the laminate core smooths things out along your ride. Can’t say enough about how much fun this ski is! The durability of the Raven’s semi-cap ABS sidewall construction makes them pretty bomb proof and will keep them looking good over the long term. 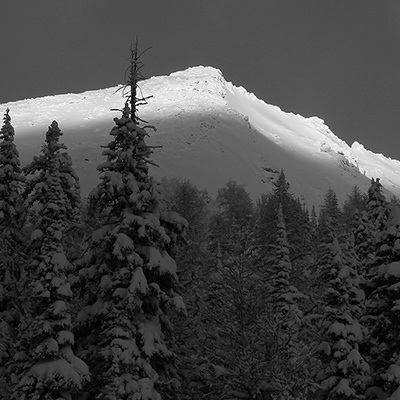 The only real down side to the Raven for us backcountry skiers is that there is no tail notch for skins. I tried multiple pairs of skins and everyone of them slipped off given the rounded tail design, especially when performing kick turns and burying the tail in the snow. 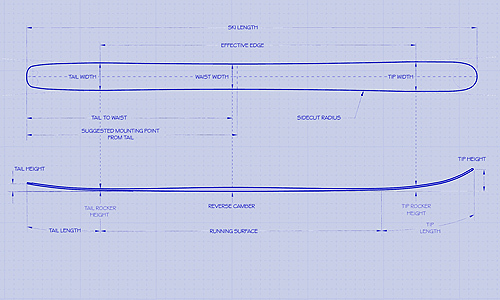 Either a flatter tail design or a notch would easily eliminate this frustration and make this ski virtually flawless. Reverse camber for smearing turns but can still carve on edge. Rails on groomers and floats in deep snow. Tails are semi-rounded and have no skin notch so skins fall off easily. Minimal tip chatter but nothing that affects enjoyment. Could have wider tips for deeper snow. Did we miss something? Are we totally out to lunch? Let us know what you think. People like/dislike gear for different reasons so chime in below and we'll get a well-rounded evaluation. You'll need to login or register before you can comment but it only takes a few seconds, then you're good to go. and I´m wondering if I can get away with the 105mm brakes. Hey Alfred, yes I think the 105 brakes were what was mounted, it makes for a great backcountry set up - super light and fun!